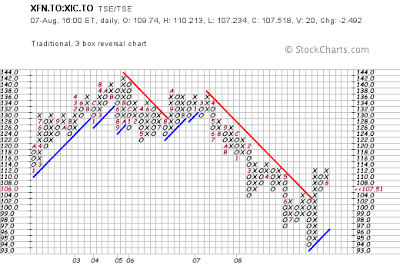 BANK STOCKS MAY HAVE BOTTOMED, ENERGY STOCKS ARE STRONG, GOLD MOVING INTO "THE BOX"
BANK STOCKS IN CANADA MAY HAVE BOTTOMED… A market that won’t go down on bad news is “washed out” and will go higher. This week’s earnings reports, which generally set the tone for a strong 4th quarter in Canada, revealed bad news. Yesterday, Bank of Montreal and Bank of Nova Scotia reported lower than consensus results. Yet the stock prices of the banks rallied on the news. TD Bank even surprised us with a dividend increase, while others used the quarter to write off “everything including the kitchen sink”. How can the market go up on bad news? I like the expression “baked in the cake”, which means, the bad news was already priced into the market and when the news came out the market shrugged it off. Seasonally, the Canadian banks are heading into their best period of the year – September to December. Buy the entire basket by purchasing an ETF (Exchange Traded Fund) like CEW.a or XFN for exposure. Use a stop loss below the most recent July 15 lows. ENERGY STOCKS ARE ENTERING A SEASONALLY STRONG PERIOD… Just as Hurricane Gustav is heading towards the oil and gas producing region in the Gulf of Mexico, oil and gas prices are firming. This co-indices with the seasonally strong period for Natural Gas. A couple of ways to play this are: buy GAS on the TSX or UNG on NYSE (for the pure commodity). 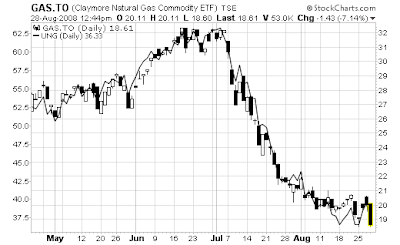 You could also buy a “gassy” stock such as Encana ECA on TSX. 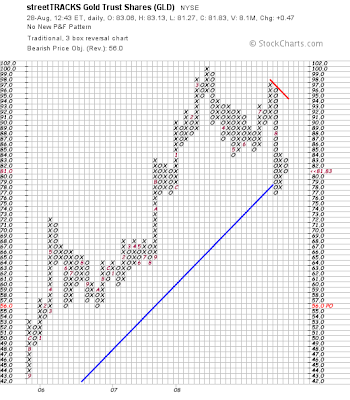 GOLD IS BOUNCING INTO “THE BOX”… Last Friday I wrote about Gold recovering from an over-sold bounce from $775 back to “the box” indicated by the $890-910 area. I continue to believe long-term that Gold has a place in your portfolio, however, on an intermediate-term basis (3-6 months) I feel the $890-$910 area may be a good place to take profits. 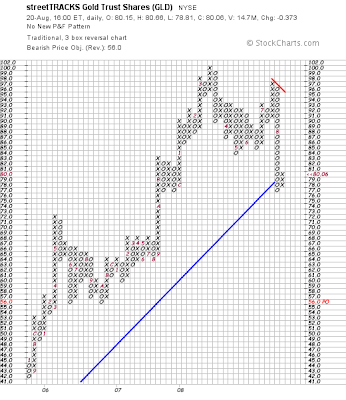 GOLD PRICE IS BOUNCING… Last Friday Gold broke it’s Bullish Support Line (blue line in Chart 1). 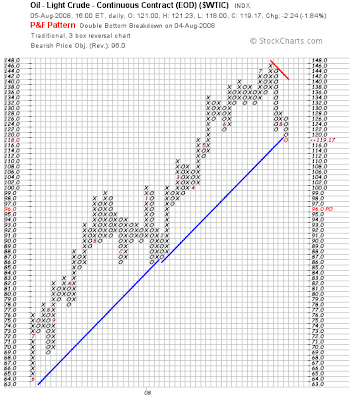 This trend-line had been in force since 2004 and may have significant implications for the long-term trend of Gold. It suggests that the market is more concerned about deflation, rather than inflation. Prices are bouncing back to “the box” marked by the 50-62% retracement level (e-mail me for details on this if you are interested). This should take GOLD back to $890-910. 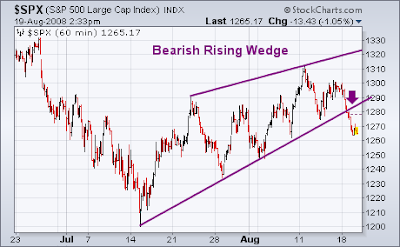 US STOCKS FAIL IMPORTANT TEST… The broad based S&P500 index has completed a bearish (negative) rising-wedge pattern. I’ve been saying for some time that the rally is US stocks is just a bear market bounce. Dow Theory suggests we are still in a bear market and many sectors are failing at their important 200 day moving-average trendline. Lowry’s Selling Pressure Index hit a new high yesterday. Big money is still selling into this market, which means maybe we’re more than a month away from a potential bottom. We’ve never seen a bottom within a month of a new high on the Selling Pressure Index. The main direction of the US stock market remains down. (See current Dow Theory position on right). CANADIAN STOCKS SHOWING SIGNS OF A BOTTOM?… The Bullish Percent Indicator for Canadian stocks is currently at 32% and is not on the way back up. 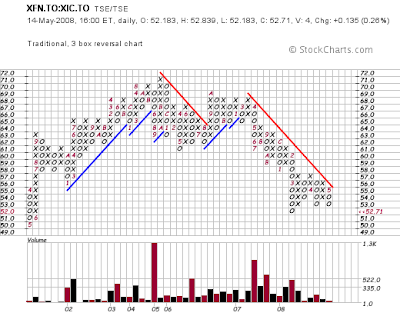 Recall that a BUY signal is issued if the indicator goes below 30% and then reverses up over 30. This happened yesterday. Adding strength to the bullish case is that the Toronto Stock Index has a tendency to bottom in the 4th quarter. Recall how many bottoms have been forged in the September to October period. This is an encouraging sign given. COMMODITY PRICES REBOUND… After seeing massive strength in the US Dollar the past two weeks, the dollar is taking a breather and allowing commodities to rebound. One reader asked if the upturn included agricultural markets. Chart 4 shows the DB Agricultural ETF (DBA) a big winner from the first half of 2008. 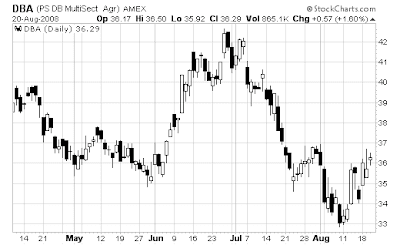 A negative crop report from the USDA may have signaled the bottom. BUYS can be made here with a stop-loss below the recent low. OIL BREAKS UP-TREND… It was a gut-wrenching July for commodities in general. The long-term trend for oil prices has been broken. That said, at least one analyst believes oil will reach $150 in 2009. Chart 1 shows the new technical target for oil is $96. At that price, a lot of Canadian oil and gas companies are still very profitable. 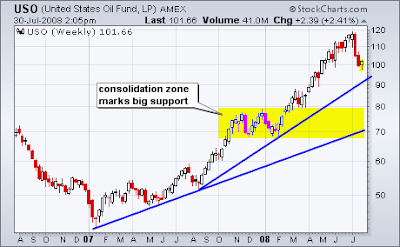 Moreover, Chart 2 shows that oil is declining to an area of support. On June 4th, I cautioned that it may be time to take profits in oil stocks. Many of you did, and it has turned out to be a good move. If oil drops to the yellow highlighted level, it may be a good time to add to oil and gas stocks. 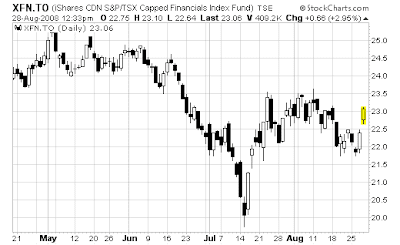 CANADIAN BANK STOCKS RALLY… I continue to get a lot of questions about the banks. Let’s revisit the “soulless barometer of performance” — a Point and Figure chart. 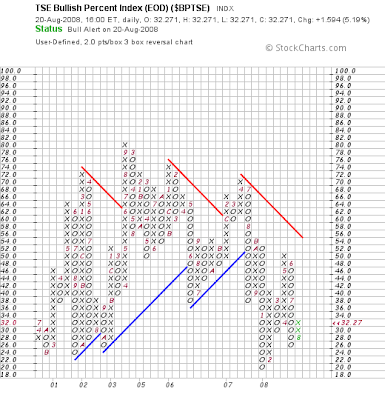 You may recall that back in May (Chart 3) the Point and Figure chart was suggesting we “wait” to buy banks. When we did this test in May, it suggested we should pay close attention to TD Bank and Bank of Nova Scotia (BNS). 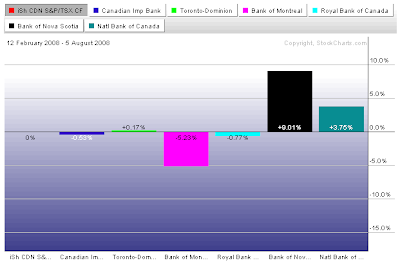 Bank of Nova Scotia continues to be the relative strength leader in the group. COMMENT: I prefer to use ETFs (exchange traded funds) to gain exposure to the group. This way, we only have to get the market call and the sector call correct. If conditions are ripe for bank stocks to do well, they will all do well. Stocks behave like fish – they swim in schools.